Packed full of nutritious ingredients, this Light and Creamy Apple Salad is such a treat, and it’s ready in about 10 minutes! Need a quick and healthy side dish, breakfast, or snack this season? 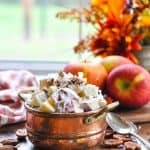 Packed full of nutritious ingredients, this Light and Creamy Apple Salad is such a treat, and it’s ready in about 10 minutes! Have you noticed that we’ve been enjoying a few apples recently? Actually, about 54 pounds of apples, to be exact!! To say that I had to get creative in the kitchen would be an understatement. After canning my last batch of Slow Cooker Applesauce this week, I can honestly say that we have eaten our way through every single bit of that delicious fruit! Today’s recipe is one that I pulled together as a quick side dish to have with dinner one evening, but I have also continued to enjoy it with breakfast, lunch, and snacks. Fresh, simple ingredients are THE BEST, right? 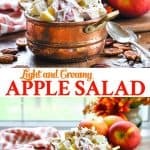 How do you make an apple salad? I love the combination of flavors and textures in this sweet apple salad! It includes creamy Greek yogurt and mayonnaise, warm spices, plump juicy raisins, and a crunchy pecan topping. First, start by tossing together the apples (I like to use a combination of both red and green apples for a perfect combination of color and taste), the golden raisin (dried cranberries would also be great), and a small splash of apple juice, orange juice, or lemon juice. The juice adds a nice touch of bright flavor, while also preventing browning on the apples. 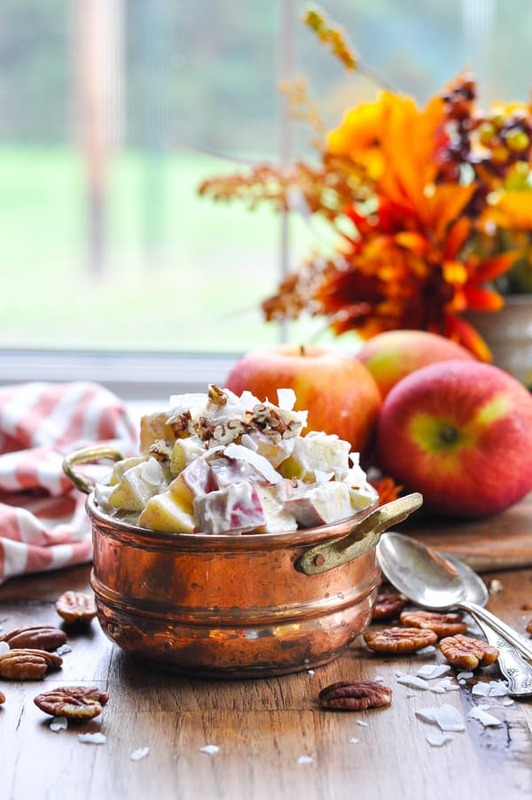 In a separate small bowl, whisk together vanilla Greek yogurt, mayonnaise, and apple pie spice. Fold the dressing into the apples until completely combined. At this point, you cover the bowl and refrigerate until ready to serve; or you can go ahead and garnish it with the pecan and coconut toppings and serve immediately. The balance of Greek yogurt and mayonnaise gives this apple salad with mayonnaise a rich flavor with a healthier nutritional profile! 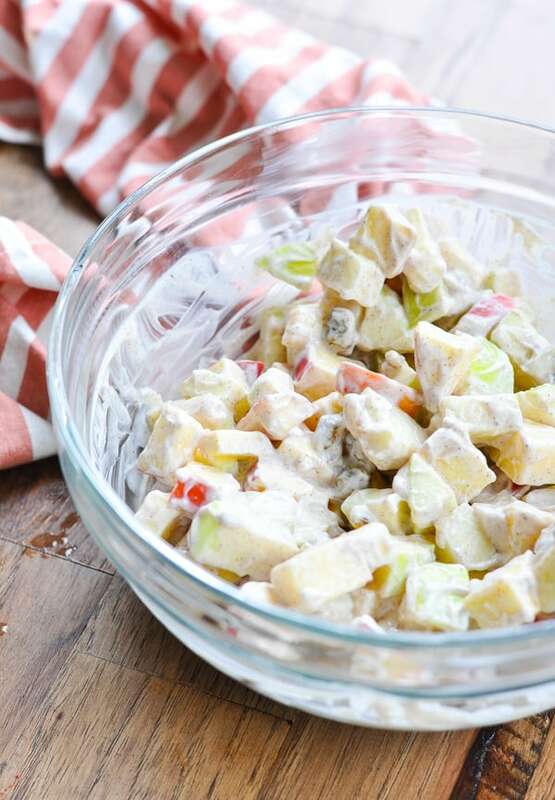 Make this apple salad with celery — it will be like a Waldorf Salad! In a medium bowl, toss together apples, raisins, and juice. 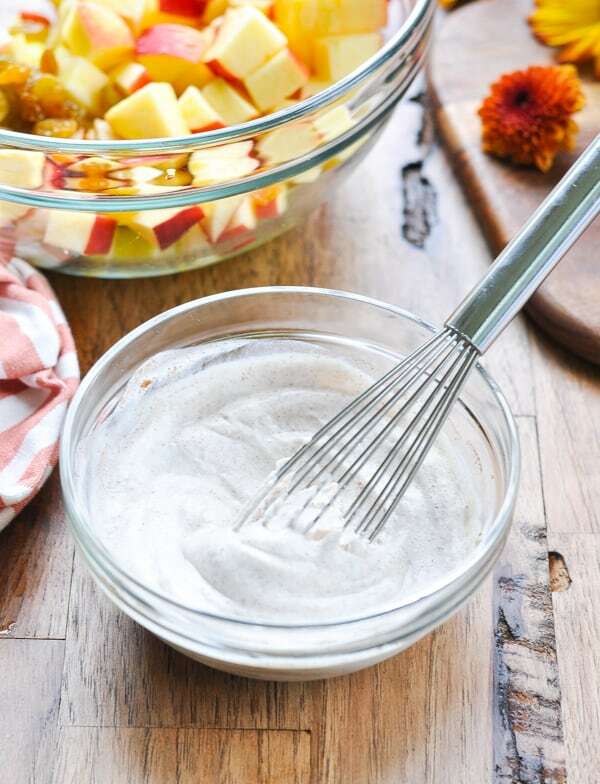 In a small bowl, whisk together yogurt, mayonnaise and apple pie spice. Gently combine yogurt mixture with apple mixture. Refrigerate until ready to serve. Just before serving, sprinkle with pecans and coconut. Prep Ahead! This apple salad stays fresh in an airtight container in the refrigerator for at least 2 days. Just wait to add the nuts and coconut on top until you're ready to serve. 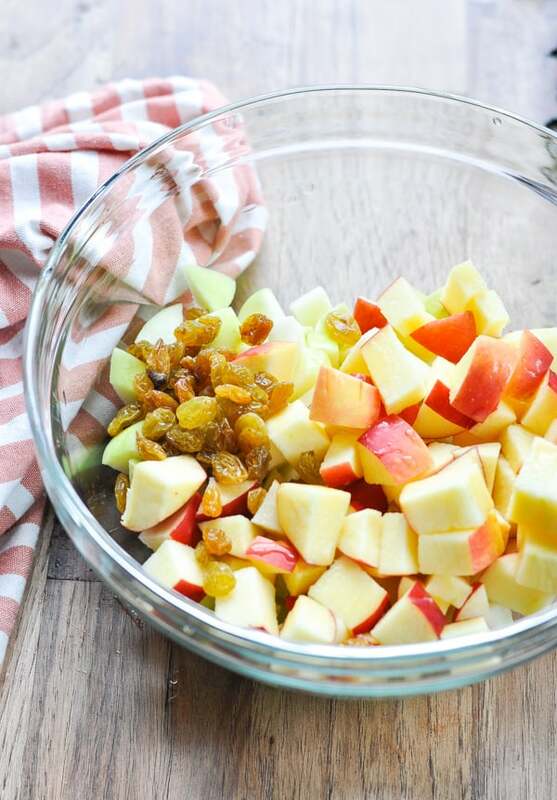 Make this apple salad with about 1/2 cup diced celery -- it will be like a Waldorf Salad! This post was originally published in August, 2015. It was updated in October, 2018. Wow 54 pounds of apples is a lot! But you are so creative with your apple recipes, I love it! This salad looks delicious, Blair! I’m loving that creamy dressing. Sounds perfect for breakfast or lunch! Apples are the only reason I’m excited for fall. I simply love them. 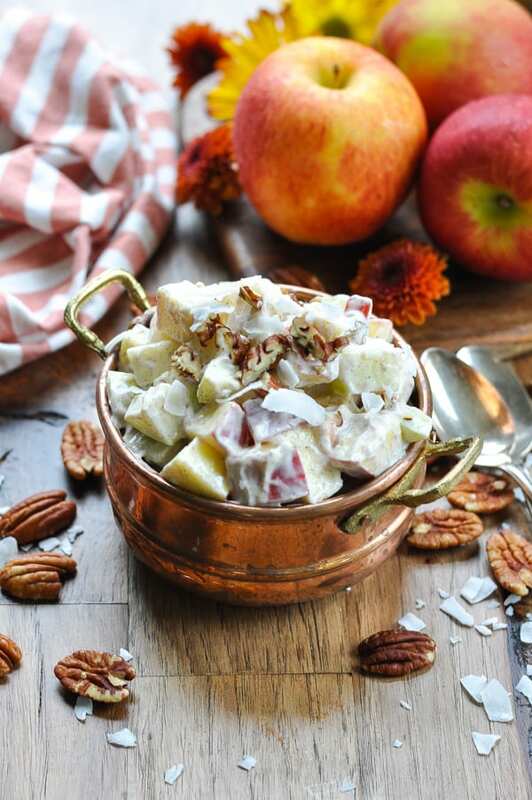 This apple salad is the perfect way to start my Friday! Yay for apple season!! I love that this is such a perfect dish to add to any meal! Definitely keeping this recipe close by this fall!! Pinned! I love everything about this recipe! My son would gobble it up for sure too!